Summer is officially here in Phoenix, which means soaring triple digit temps have officially taken hold of the Valley with no relief in sight. Like we've said here on the blog before, this time of year is a lot like winters were for me growing up in Michigan, running from the car to the house as quickly as possible and staying inside and out of the elements as much as we can. Not only does this scorching summer heat change the way we go about our daily activities, as one can imagine, it completely changes the way we dress. It's really hard to dress for 120-degree heat and feel compelled to wear anything but a bathing suit or running shorts, but over the years I've definitely adapted to dressing for the heat and feel like I'm getting better at knowing what will survive a day running around in the triple digits and what won't. 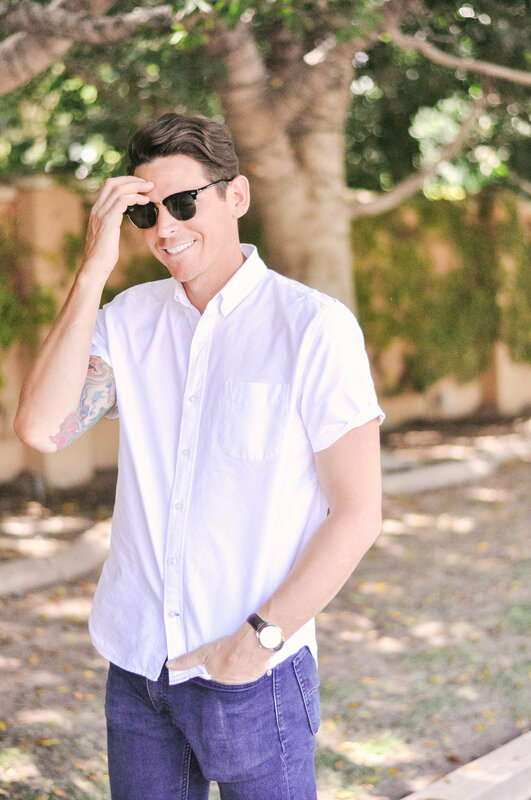 As a native Arizonan, the summer heat totally doesn't bother Chris or any of his Tucson buddies, and they've completely perfected their style game for this cruel climate, carving out their own unique space in the style-sphere that I'm kind of in love with. When I first met all of them, I immediately fell in love their style because to me it was so authentically "Arizona". 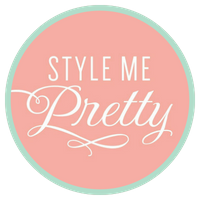 They'd probably laugh at the notion that they've sort of mastered a style all their own, but it's true! It's like they've created their own set of rules for what's cool and what wears well in this climate and found a way to look simple, casual, comfortable and yet completely put together all at the same time. It's definitely different than the summer uniform worn by Midwest men, not quite the same as that noticeably West Coast look and doesn't quite qualify as "hipster" either. 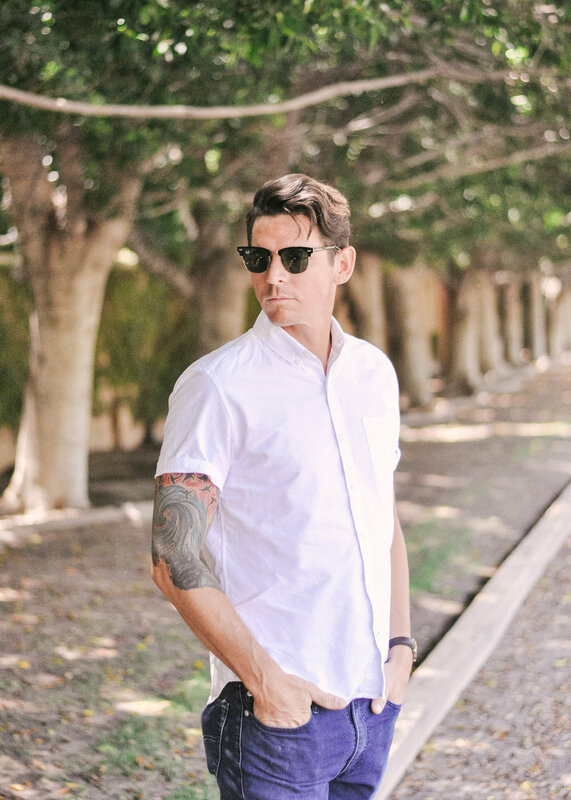 For Chris and co. the short-sleeve, lightweight button down is a style staple in the summer, or really any time of year in the desert. Which is kind of genius when I think about it. 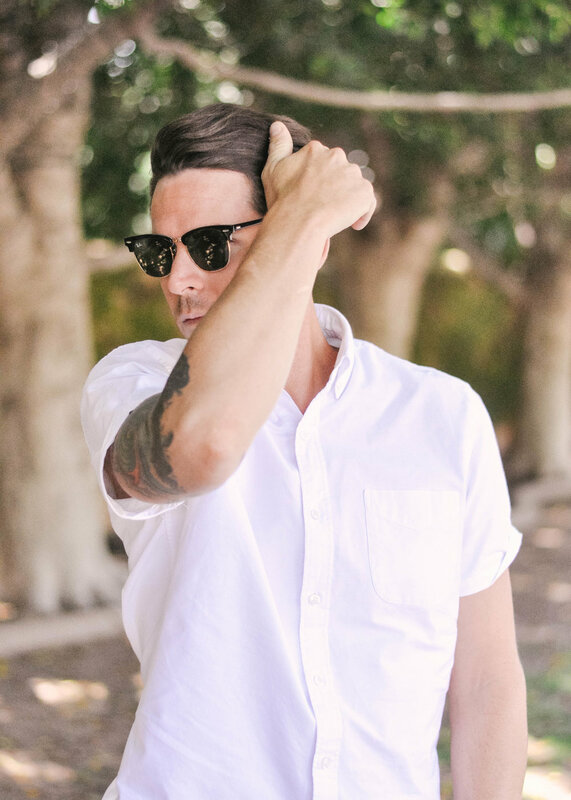 It allows a guy to look polished in our kind of crazy summer weather without having to wear a stuffy suit or long-sleeved shirt and spend their summer days in an uncomfortably sweaty state. And in Arizona everyone kind of accepts that a little more casual and comfortable is just the most reasonable uniform. Chris and I were just commenting on this when we were looking at cars at the car dealership. It actually looks weirder to us when someone forces their employees to don thick suits or long sleeves and long pants when it's 120 degrees outside, all for the sake of some archaic idea of formality in the workplace. I love formality and tradition as much as the next lady, but that's just silly. That looks way more out of place and inappropriate to me (especially when they're sweating like crazy) than a short sleeve button down and nice lightweight pants or shorts do. I'm pretty sure one side of Chris' closet is filled solely with short sleeve button downs of all kinds. And the funkier the print, the better! His lobster shirt is a personal favorite. As for me, I've just really been loving all of LOFT's new arrivals lately! Has anyone else notice that they're seriously stepping up their game? 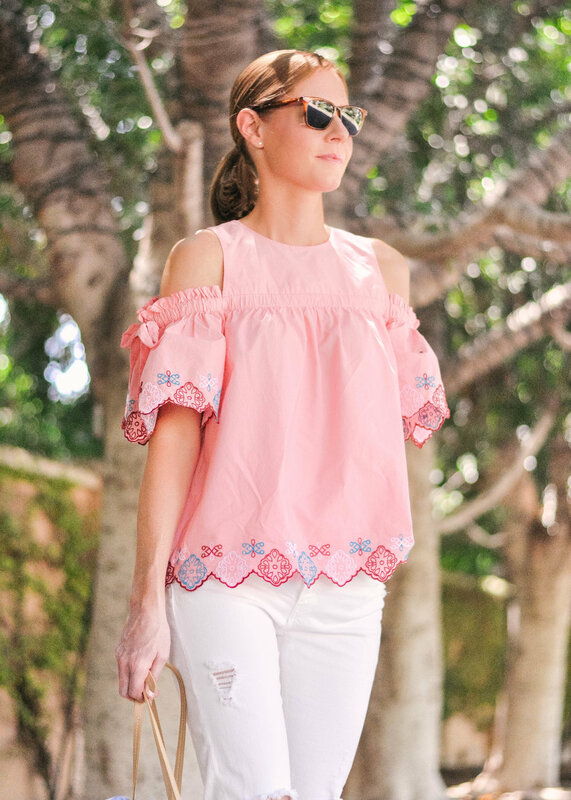 I mean I always love LOFT, but they're perfecting the art of the lightweight, easy breezy summer wardrobe! They just finished one of their crazy 40-percent-off-the-entire-store sales, but they're still rolling out special flash sales almost every day, which I always look out for in my inbox in the morning (today they're doing 40% off of all dresses - and there are so many good ones). And don't forget to keep your receipt every time you buy something full-priced at LOFT. They have a special price adjustment program where you can bring your receipt into the store within 7 days of your purchase date and get a price adjustment on any full-priced items you purchased that have gone on sale within those 7 days. Which can save you some serious summer spending cash! If you have any questions about how that works, just look on the back of your receipt for the details or you can ask one of their super helpful store associates. And this totally isn't sponsored, I just love their vibe! 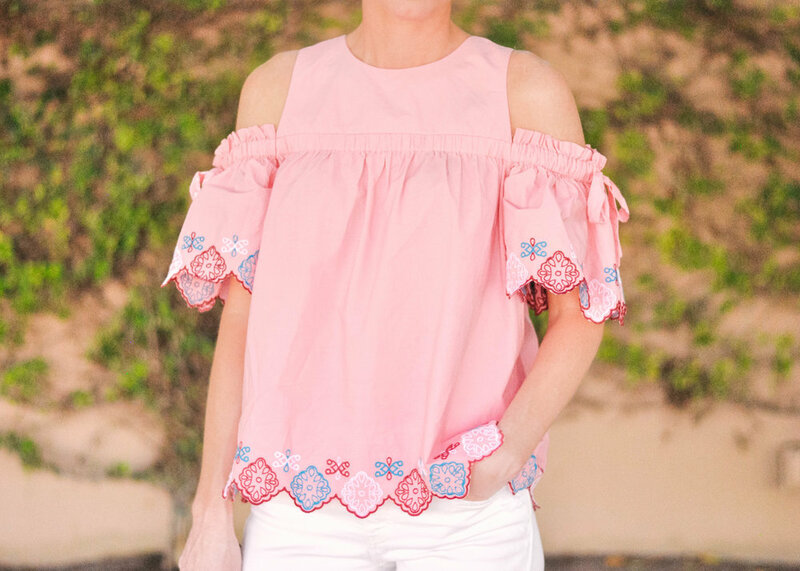 A lightweight dress in a breathable fabric is the most obvious choice for a summer uniform when you're trying to withstand the heat, and I definitely wear my fair share of dresses throughout the summer, but if I can find a comfortable pair of lightweight pants to wear and breathable, fun, flowy tops like this embroidered pink top from LOFT, I'm all about it. Especially because for my busy, active day-to-day lifestyle, dresses aren't always the most practical thing to wear. And truth be told, I spend a lot of my time during the week inside an office and studio, so in the summer for me it's as much about finding ways to survive the blasting air conditioning as it is about surviving the heat. Anyone else have this problem during the summer? It's horrible! Sometimes I think my body goes into shock for all extreme temperature changes I put it through in one day during the summer. So it's dresses on the weekend and comfortable, lightweight pants paired with breathable tops during the work week and maybe, just maybe I'll make it through. 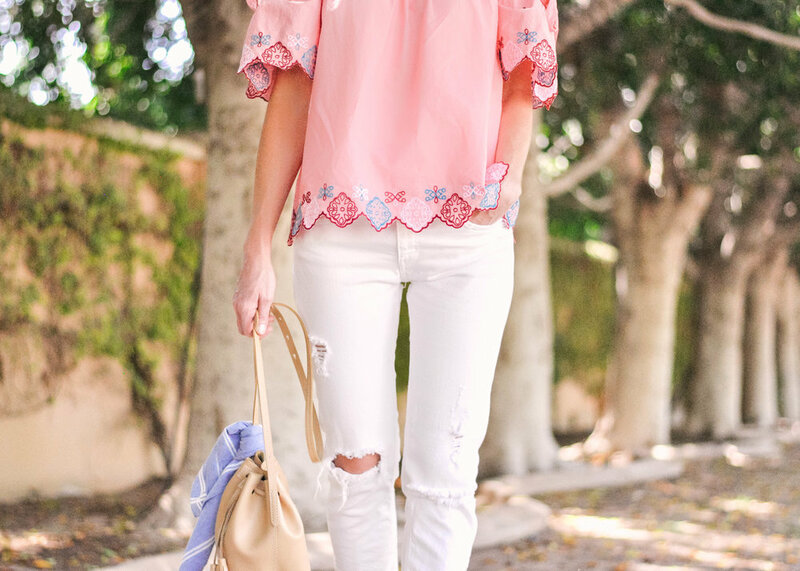 I rounded up a ton of my favorite fun summer and also work-ready tops from LOFT above! Wardrobe aside, one of the tried and true ways to survive summers in Arizona? Get the hell out! So many Arizonans spend their weekends in cooler climates in California, Northern Arizona and the Pacific Northwest, and we'll be doing as much of that this summer as possible. Chris is currently in California spending some much deserved time on the beach with his parents in San Clemente, and soon I'll be heading to Northern Michigan for a week of lake time with that crazy fam of mine, and I can't wait! This will be the first year that Chris won't be spending 4th of July in Michigan with us at the lake house since we started dating, and we're all going to miss Chris' endless energy, sandcastle-building skills and wake-surfing expertise so much!